NB Commentary: Dr. Boyce Watkins & Zaza Ali discuss some things around black folks having their own business and what it means, more so than the title of the video suggests. My commentary addresses that part of the video. See my comments below. 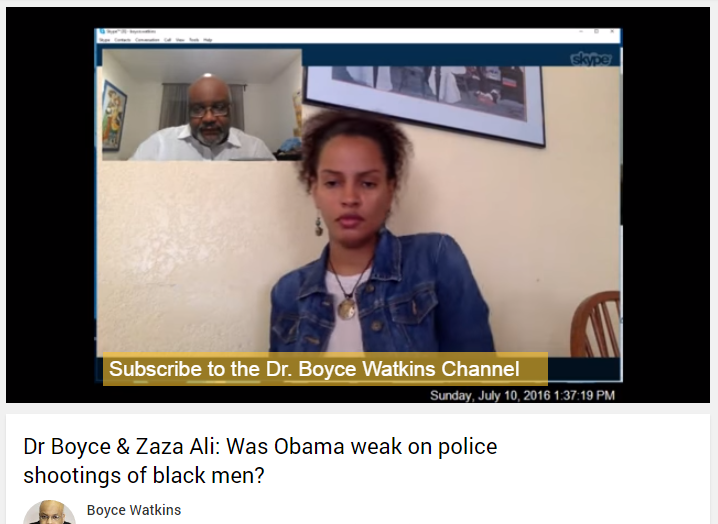 Was Obama weak on police shootings of black men? Before I comment I tend to read a lot of the comments to see what folks are talking about and to learn something new as well. On the real though, I have been independently employed for most of my adult likf, and that’s about 40 years. At this point the idea of working 9-5 is terrifying to say the least. But folks who do work 9-5 for even half that long are just as terrified to step away, and that ain’t got nothing to do with color. This culture does not teach us to be anything else but workers. Get and education so you can get a job. Not get an education so you can provide jobs. I think that we have to be careful not to be disingenuous. There is no multi-level pyramid scheme out there that will have you living high off the hog, basking in the sun on the beach all day, while your business grows and grows without you having to do something. Having your own business is hard work. I don’t know about them two, but I put in more hours than I would ever have to working 9-5 and I am more responsible for what goes out because it’s mine. I think there are many prongs that can be used for African Americans to become more self reliant. Some are employers others are employees. It’s how we play the game. I really am not too cool with doing it the capitalistic way, however, if you are going to build a business in this paradigm you are gonna have to cross the capitalistic Rubicon on some level. There are so many stipulations that are required for you to even become incorporated. And this system is set up to only let a few fish swim upstream. Folks should take a few classes before you step out there. Others should have a trade. We need so many skilled workers, cause even though you have your own business you will fare much better if you have helpers. Everybody can’t be a chief, but a good solid business plan, with good solid workers who share your vision.. can work wonders. We as a people have a lot of “Soul Work” to do on the level of having our own business and working with or for other Black folks. So, yeah, get all the information you can get about starting your own business, and if it scares you too much, then see if you can work for an already established black business owner, and if that’s not an option, support Black businesses. I have seen so many come and go due to lack of support as well..
There’s nothing like having your own, but you gotta put in the grunt work and the sweat equity to make it happen and keep it happening. Real Talk!